SOCHI: If a language has a word for the joy of misfortune at another person’s expense, you can assume it has a word for most things and in Sochi on Saturday night, at least two members of Germany Football’s World Cup 2018 party certainly appeared keen to remind their Swedish counterparts about the meaning of schadenfreude. Joachim Loew was confident last Sunday, speaking in the aftermath of the surprise opening defeat by Mexico, despite the arrogance, recklessness and naivety his players had shown in that display. Germany crafted enough opportunities to draw that day, as Loew rightly pointed out, but that was irrelevant. They had lost because initially, Juan Carlos Osorio‘s side had outclassed them. It was a striking, bullish tone for Loew to take, one that could be understood given his side’s pedigree but one that was totally unsupported by their performance. Statisticians downgraded Germany’s chance of progressing from around 90 per cent to 64 per cent after the Mexico defeat – moving Die Mannschaft from almost-certains to mere probables. 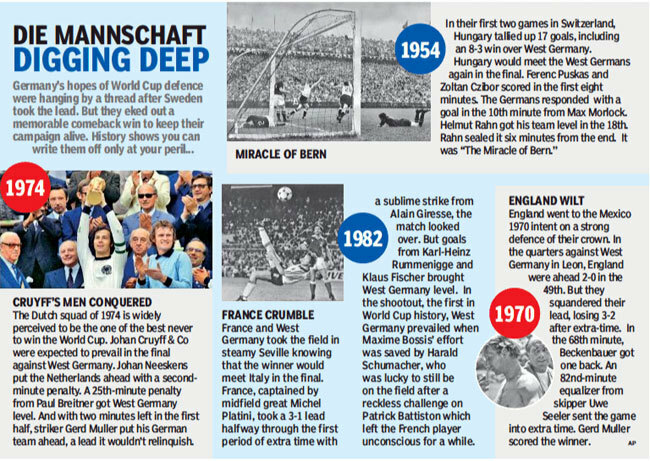 Even now, in the immediate hours after Toni Kroos‘ spectacular stoppage-time free-kick, Germany’s place in the second round cannot be confidently predicted. Following this victory with another against South Korea on Wednesday in Kazan – back-to-back wins, the best Loew could have asked for last Sunday – may not be enough. There is the hellish prospect of a three-way tie between Germany, Mexico and Sweden all on six points in Group F. If, for example, both Germany and Sweden win 1-0 on Wednesday then Loew’s side will progress from Group F as winners. If both Germany and Sweden win 2-1, Die Mannschaft will be eliminated, missing out on second place due to Mexico’s superior head-to-head record. The possibilities and permutations are various and from here, how Wednesday pans out is anyone’s guess. It made sense, then, that while the overriding emotion at the end of the night among players who stopped to speak in the mixed zone was one of relief, there was also talk of the need to improve, and a realisation that the drama of their victory should not mask another performance that often underwhelmed, especially in the first half. Sweden found the same space behind the Germany defence as Mexico, despite not having much in the way of speed to exploit it. Germany, having come so near to losing their status as world champions, will not want to find themselves that close to the edge again.